Photographing engagement sessions is a great way for me to connect with you and your fiancé before the wedding, and a great chance for you to get used to being photographed! I photograph at a location that is important to you– maybe it’s the town you went to college together in, the bar where you met, the boardwalk you walked on your first date, or even one the many local parks. If you have no idea, that's okay too, I am ready to offer a handful of suggestions around your area. Feel free to bring a "prop" or something relevant to you as a couple. This could be a guitar, your dog, a bicycle, or anything that represents what you enjoy doing together! An outfit change is welcome, and I always suggest layering for different looks and to keep you comfortable if the weather isn't as planned. Several wedding collections include an engagement session with the high-resolution files, but for those collections that do not you can add the session only for $95 and order a la carte, or get the session and all digital files for $395. After you see the images you can choose if you want to make an album or get some prints, enlargements, save the dates, or a signature album (where the guests sign in the white space around your engagement photos, in lieu of a traditional guest book). Interested in a proposal session? I can be very sneaky and get the photographs of the question-popping without her knowing, and then we can do an engagement session right after! Same pricing as engagements, $395 for the session and all high resolution files. 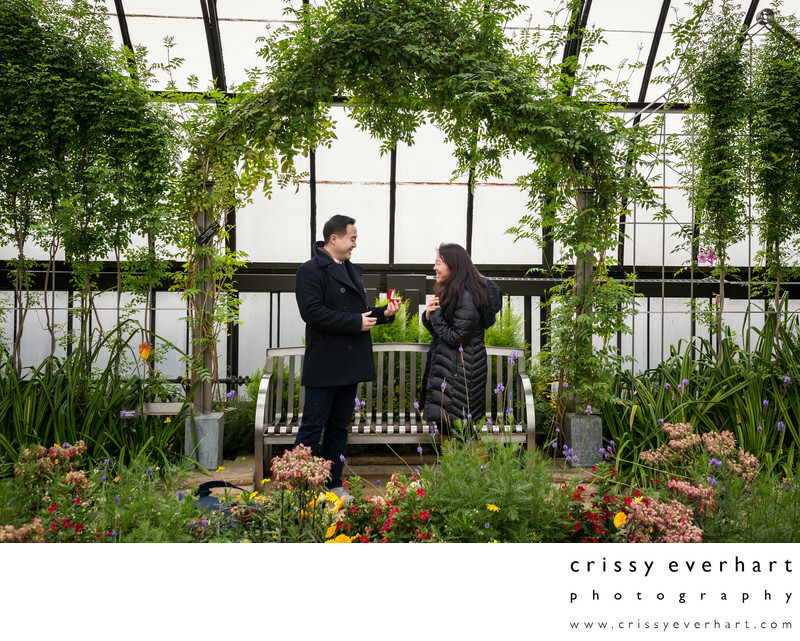 Check out this video of a recent proposal and engagement session at Longwood Gardens. Engagements and proposals are photographed in Center City, on the Main Line, in Chester County, Delaware County, Montgomery County, New York City, Delaware, New Jersey and the local beaches. I am happy to answer any questions you may have about weddings or portrait sessions, feel free to contact me to start a conversation! My studio at Historic Sugartown in Malvern, Longwood Gardens, Belmont Plateau, Tyler State Park, Long Beach Island, New Jersey, Hiway Theater, La Casa Pizzeria on Long Island, South Philly, Old City, Ridley Creek State Park, West Chester, Blue Bell, Philadelphia Museum of Art, LBI, Chinatown, 30th Street Station, Logan Square Fountain, Art Museum Steps, Please Touch Museum, Fairmount Park, Marshall Square Park, Chester County and Delaware County, Pennsylvania.